These blogs are aimed at documenting the features of piSignage and how they are utilised in implementing Custom Digital Signage displays. From the most basic features to custom features designed on request of our customers, we will explore everything in a series of blogs. You can display a single playlist or a set of playlists on your screens with piSignage. All you need to do is deploy the playlists to the Group of players. ( Read How groups simplify player management in piSignage ) . TWhen there are multiple playlists, can be scheduled in advance, allowing you to display content as per your requirement, without having to manually deploy playlist each time. for eg. You can Schedule a playlist to be deployed only at a particular time during a day, on particular days during the week/month etc. piSignage scheduling functionality offers you great flexibility in deploying content. In a series of articles we will explore in detail, various options available while deploying playlists . First Sign in to your piSignage account , go to Groups in the left panel and select any group. When you create a Group you have to assign a Default playlist for the group. 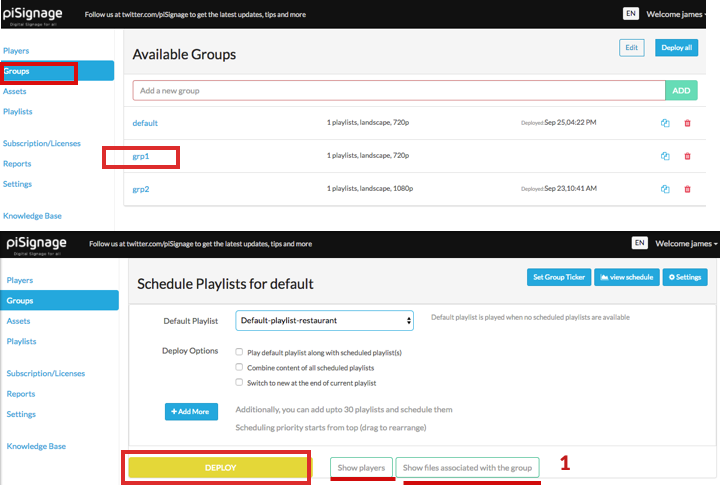 As the name suggests, this playlist will be played by default when you have deployed the group without scheduling additional playlists.This feature is useful for a very basic signage implementation when you have a single playlist to be played throuoghout the day. For a better understanding, lets take an example of a restaurant, which has a single menu for the whole day. 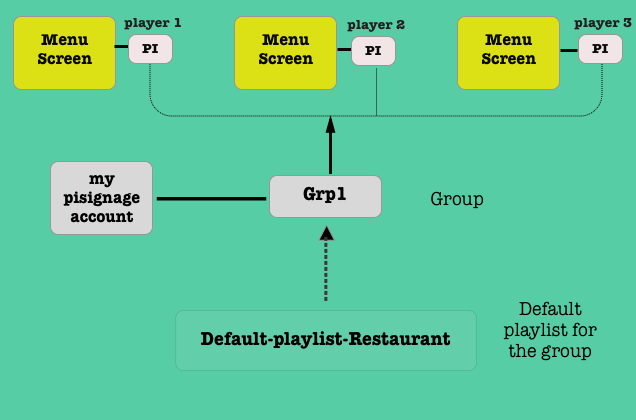 In the example, all the players required to run the menu playlist are assigned to group Grp1.The default playlist assigned for the grp1 is playlist named Default-playlist-Restaurant. This playlist will be running on all the players assigned to Grp1 , when this group is deployed. Notice here that we have not added additional playlists. (Refer the images below).This is the simplest use-case in pisignage. Now the playlist is made of assets like videos, images,web and streaming links etc. The Show players and Show files associated with the group buttons ( refer Screenshot above ) , just as the name suggests allow you to take a quick look at players and files associated with the GROUP. The Deploy button will have Yellow background when a playlist is not deployed. Once you deploy, it will turn green. Default playlist has no assets. Default playlist is TV_OFF. The TV_OFF playlist is used particularly for automatic control/ advance scheduling of TV ON & OFF Timings. Deploy it as a single default playlist to Turn OFF the screen from pisignage account instead of manually turning off the monitor. Deploy any other playlist and the screen will be running again. We will See about this feature in Another Article. Default playlist is Advertisement playlist. These are playlists with unique functionality. Avoid making an ADVT playlist as default if you have no additional playlist included. As said above Advertisement playlists are unique kind of playlists, a special feature in piSignage. As the name suggests, these are used to insert ads periodically between the regular playlists. we will explore Advertisement playlist functionality in another writeup.